Today I'm getting ready for a workshop with two friends , Frances & Debbie, being held this coming Sunday. We'll be covering off the same techniques and projects that I did with my friend Kelly on Feb. 1st (see below). The only change will be the bendy fold Valentine's card. 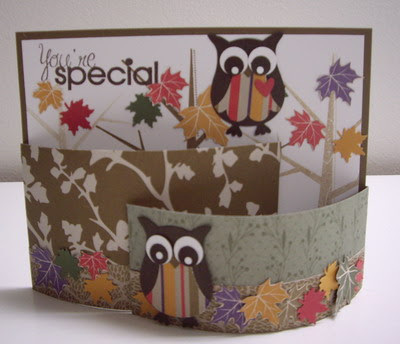 On Sunday, I will be showing my friends how to construct this cute card, but we will be making an "owl" card which can be used for a number of occasions. I just love the look of this card - it's so fun! Again, this tutorial was sent to me by Emma Fewkes. Click here for Emma's instructions on how to construct this card. Hope you like. "Bendy Fold "Season of Friendship"
I started by stamping the tree from Season of Friendship (SU!) stamp set onto Whisper White cardstock in Soft Suede ink (the first stamping was in the middle and the trees on either side are a second stamping which is lighter). ent in Early Espresso in the top left-hand corner (it's important to stamp the sentiment BEFORE attaching the leaves). I then mounted the stamped image on Soft Suede cardstock. I used the Autumn Traditions designer paper and mounted pieces on both the left and right-hand side pieces that are backed with Soft Suede cardstock (this makes the sides of the card very sturdy and helps to keep the notched construction in place). Do not cover the 1/2" scored edge which wraps around the back of the card (see card instructions link above). I attached the owls with sticky strips, one on the ground and one sitting on a branch.